The idea for SQLite Wrapper was purely dictated by the demand. We, at BuiltToRoam – company that I work at – are dealing with all types of universal application projects (Universal Apps for Windows 8.0-8.1 and Windows Phone 8.0-8.1 or UWP for Windows 10) that are required to use database(s). With every new application, we were basically re-using same code that was written for one of the previous apps. It was done in a really “savage” way, by copying and pasting core functionality and adjusting it accordingly to the needs of the app. Not good...something had to be done. The decision was made. 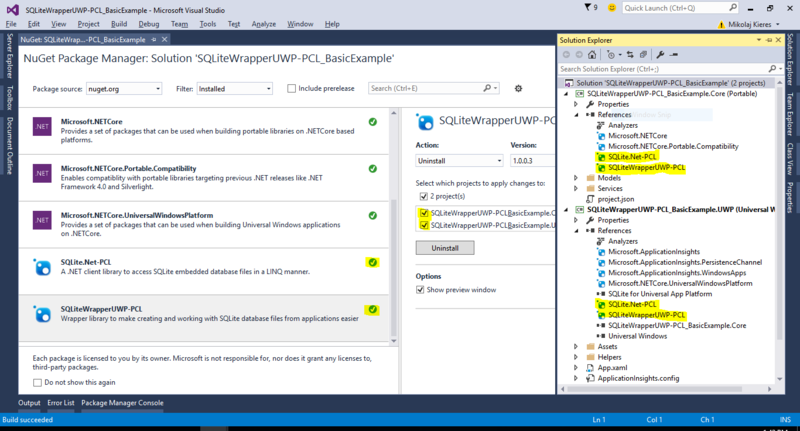 We created a PCL (Portable Class Library) wrapper over SQLite.Net-PCL library that implements some basic functionality for Creating, Reading, Updating and Deleting (CRUD) operations on the database tables. SQLiteWrapper came to life on a GitHub repository. 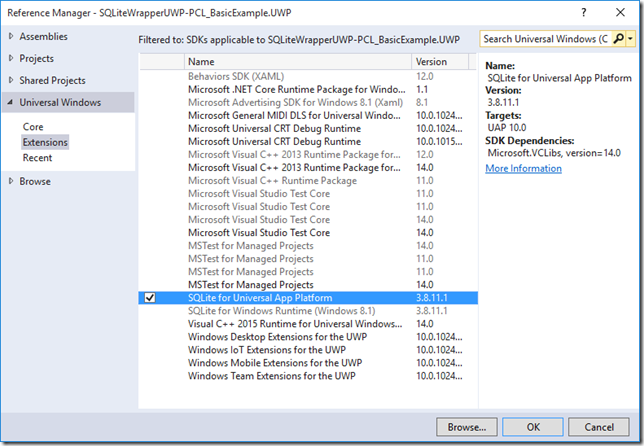 From the beginning of it’s existence in the Open Source space I was tempted to create a NuGet package out of it. 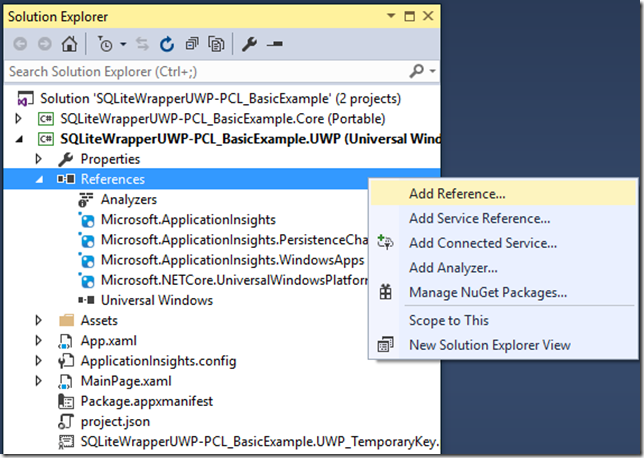 With NuGet package it would be much easier to distribute it and share it. On top of that, nothing would change in terms of GitHub repository, it would still be there so anyone could grab sources. 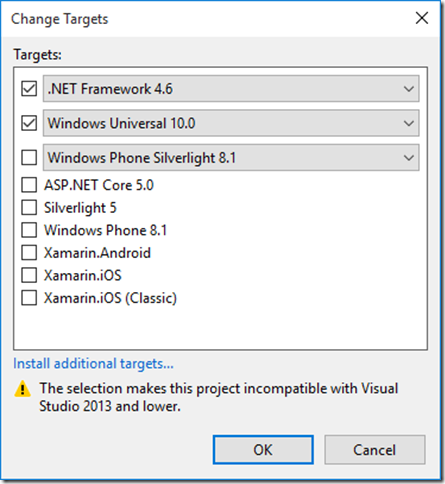 Besides..I always wanted to have mine NuGet package, even though this one wouldn’t be strictly speaking mine. Even though it is a child that whole BuiltToRaom team gave birth to, I feel like at the moment I’m changing its dippers ;]. What’s more, creating this package could finally place myself on the map of .NET world! I ended up reading some articles how to create a package, what should it consist in terms of information and description and a bit later..I present you SQLiteWrapperUWP-PCL! There’s still no information whatsoever about how to deal with it or how to use what’s inside of if. 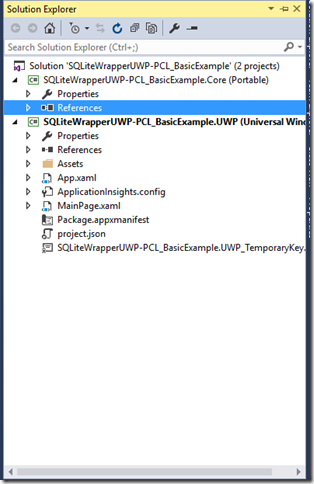 Therefore, I will try to fill this gap by guiding you, reader, through the process of creating a really basic example of SQLiteWrapperUWP-PCL usage. 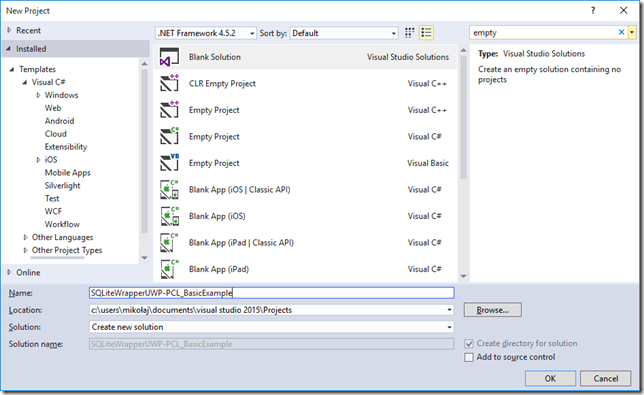 Let’s start with creating an empty solution in Visual Studio 2015 – I’m using Community edition. As you can see on the support selection screen (it appears after clicking OK on the dialog with Add New Project and choosing PCL), I’m selecting .NET Framework 4.6 and Windows Universal 10.0 (UWP). Remember to restart Visual Studio after installation has finished. 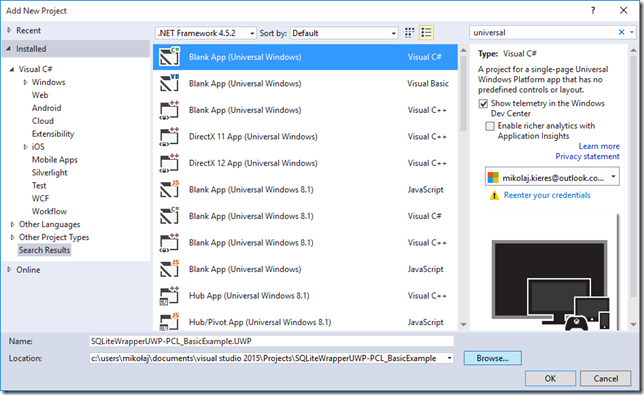 Now you will be able to Add reference of this extension to your UWP project. 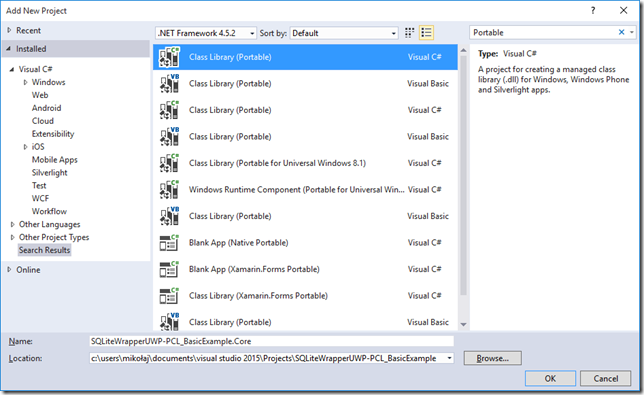 At some point you should add a reference to the Core (PCL) library in your UWP project. 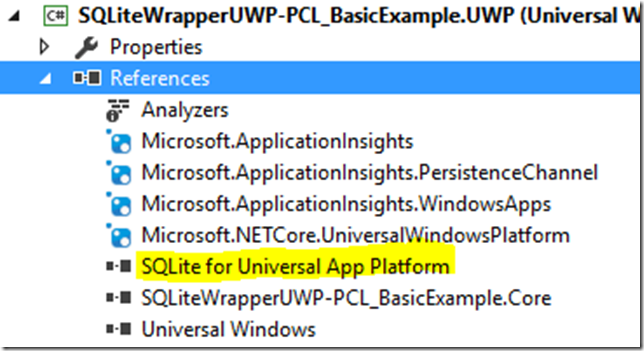 You can see that I already did that, look on the above screenshot, it sits just below the SQLite for Universal App Platform reference. Installation of MvvmCross framework will most likely create some folders and files in your project. To get familiar with MvvmCross and it’s structures, concepts and files I would recommend reading and/or watching some videos from the N+1 days of MvvmCross blog posts. Let’s start from the Core project and setting up the DatabaseService. The base class – BaseDatabaseService – is the one that sits in our wrapper and is responsible for database management (e.g. creation, opening or closing). To create either BaseDatabaseService or in this case *DatabaseService *one will have to specify a constructor parameter of ISqlitePlatformProvider, I will explain that one in a moment. In the above code besides the constructor you can see an override of the CreateAndOpenDb method. It allows as to “plug in” between the creation of the database and returning connection to it. 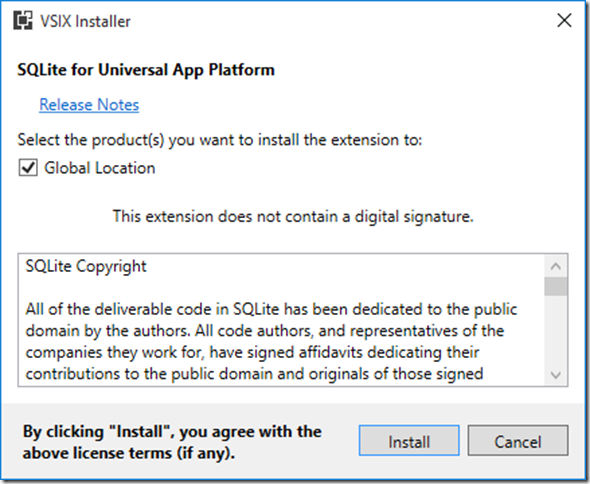 It’s done this way to make sure that before someone will start operating on the database (SQLiteConnection) they will have the proper entities – database tables – defined in it. In this case PersonEntity table is being created and afterwards dbConnection returned. Invoking dbConnection.CreateTable<PersonEntity>(); will map the model of our class to the database table. For more information about creating tables and mapping in general I'll refer you to the SQLite.NET-PCL git project site, where you can find some examples. PersonEntity is just an example of how you should structure your database entities. They should inherit from BaseEntity class so that you could use *BaseRepository *implementation – both of those classes are in the wrapper and about the second one I will talk in a moment. You should know that BaseEntity has a Id property which is decorated with [PrimaryKey] attribute and as you may suspect it will be mapped as a database table PrimaryKey. As simple as two methods, Insert and RetrieveAll. Implementation will sit in the PersonService. 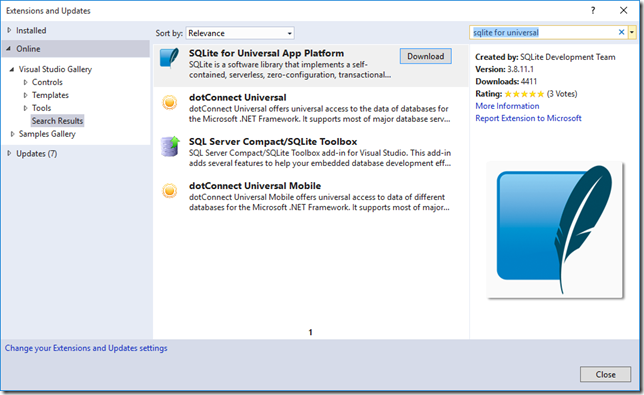 Constructor takes SQLiteConnection which is the product of database service CreateAndOpen() method call*. *There’s also Insert and RetrieveAll implementation. Both use same pattern, which is *BaseRepository<TEntity>. *Repository part of the wrapper is the “thing” that you will deal with the most of the time. In above snippet of code I’m simply creating, for both methods, *new BaseRepository<PersonEntity>, *within using statement – because BaseRepository implements *IDisplosable interface – *which allows me to operate on my table (e.g. *personRepo.Insert(person) *or personRepo.Table.ToList()). Explore BaseRepository more to get familiar with functions that we exposed (e.g. *Get *or Delete). That one is pretty easy. 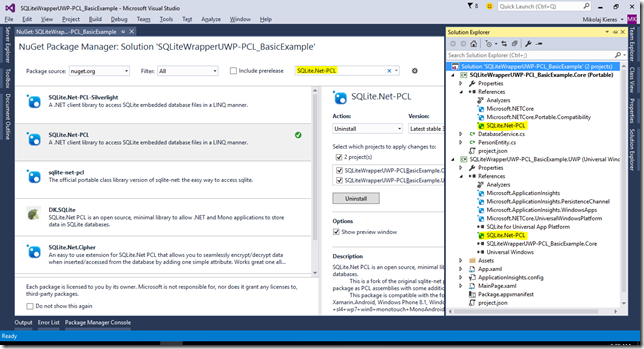 It’s purely about platform specific implementation of SQLite.Net-PLC library and how it will handle all the “low level” SQL database stuff. In this case our platform will be SQLitePlatformWinRT. Last but not least is to put all this together and insert and retrieve some actual database entries. I hope the comments and my walk through will let you understand what’s happening in this snipped of code. If you still have doubts you should definitely try it yourself! 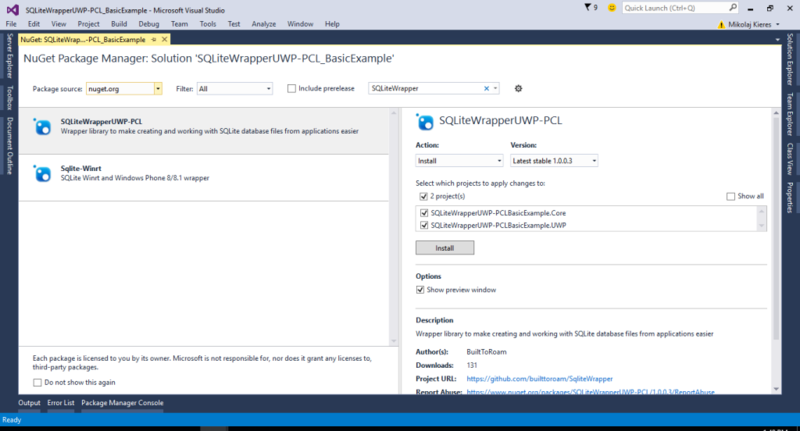 Start from checking out this SQLiteWrapperUWP-PCL example project that you just read about.